The Trump International Hotel in Washington, D.C., in 2017. T-Mobile has spent about $195,000 at the president’s hotel since April. (Photo for The Washington Post by Evelyn Hockstein). T-Mobile executives spent about $195,000 at President Trump's hotel in 10 months, the Bellevue-based company disclosed for the first time after questions from Sen. Elizabeth Warren, D-Mass., and Rep. Pramila Jayapal, D-Wash.
WASHINGTON — T-Mobile’s patronage of President Donald Trump’s hotel here increased sharply after last April’s announcement of its merger with Sprint, with executives since spending about $195,000 at the property, the company told congressional Democrats in a letter last month. 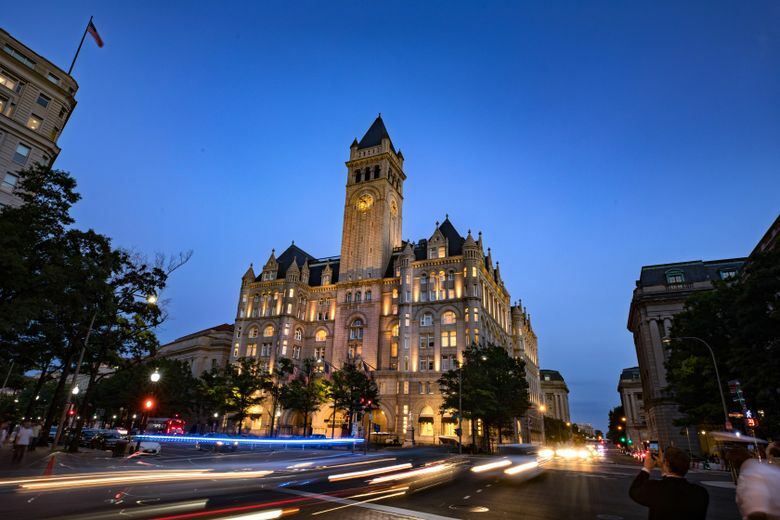 Before news of the megadeal between rival companies broke on April 29, the company said, only two top officials from Bellevue-based T-Mobile had ever stayed at the Trump International Hotel Washington, D.C., with one overnight stay each in August 2017. But the day after the proposed merger’s announcement, nine of T-Mobile’s top executives were scheduled to check in, The Washington Post reported in January. The Post, relying on internal Trump hotel documents, found that T-Mobile executives had reserved at least 52 nights at the hotel since the announcement. The company’s boost in spending at the president’s hotel as its megamerger deal is being considered by the Justice Department and the Federal Communications Commission has drawn criticism from Democratic lawmakers, who say it shows that Trump is profiting from his office. The Justice Department and FCC have declined to comment on the merger plan.